Contract Details: 1 year initial contract. Signed 1 year extension on 22nd December 2012. Signed 2 year extension on 5 September 2013. Team Honours: A-League Premiership Winner (2012/13), Asian Champions League Winner (2014). 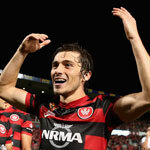 Highlight: Scored his first ever goal for Western Sydney against Adelaide United in Round 19, Season 2012/13 on 3/02/2013. Description: A young defensive midfielder who has been capped in the Croatian youth setup. 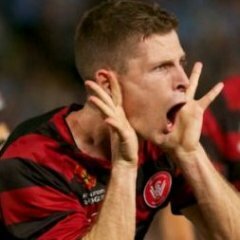 Has been deployed by Tony Popovic as an anchor man, shoring up the defensive structure to allow the likes of Ono and Mooy to push forward. The defensive anchor around which the Wanderers premiership winning campaign was founded, Poljak has earned his spot as one of the best defensive midfielder players in the competition and was rewarded by the club with a new contract, only to have that cut short by a season, Poljak moving up north to the Newcastle Jets for 2015/16 onwards. got quite the cheer when subbed on, and deservedly so. Legend. His boyish excitement whenever we scored or won games and titles is one of the enduring images of those first couple of years. I read today that Mateo Poljak is back in Australia and playing NPL for Marconi. He will be able to soon play as an Australian citizen as his papers should be coming through. I don't think he is good enough to take one of the five visa spots but he might be a chance getting picked up by an A-league club next year. He was pretty reliable for us for two seasons, still young at 28, worked his arse off every game. He's been in Australia the whole time after he left hasn't he?